Judging by the volume of the audience sing-alongs, New Yorkers remember everything about their ten years with Drake. This was the second night of the rapper’s New York City takeover: He’s performing not one show in the city, not two, but seven, including four at Madison Square Garden and three at the Barclays Center in Brooklyn. He threw a “day party” (it started at 7pm) on Sunday at another Brooklyn club. There’s a pop-up store dedicated entirely to satisfying your pressing desire for Drake merch. The reason for all this, of course, is that nearly every one of the 25 songs on Drake’s smash summer album Scorpion debuted in the Top 40. Add that to his previous hundred-plus hits since 2009’s So Far Gone and you realize that Drake has a unique logistical challenge, though one most performers would envy: How does an artist synthesize so much popular material for a single show? It helps that Scorpion revisits a lot of prime Drake territory from the past ten years. He returns to standbys; petulant, post-breakup R&B and curt raps that double as blanket dismissals of his hip-hop competition. “8 out of 10” and “Peak” from Scorpion could play easily next to “Lord Knows” and “Doing It Wrong” from 2011’s Take Care, giving any potential set list a sense of development and continuity. This was both frustrating — no one would object to hearing more of “HYFR” — and surprising: When’s the last time you cued up the Drake remix of Fetty Wap’s “My Way?” But mostly the speedy medley served as an overwhelmingly effective reminder that no solo artist dead or alive has more Hot 100 hits than this one. The obstreperous energy that animates these Drake singles is also where the opening act Migos make their living, so it made sense that they returned to join Drake for a pair of collaborations, the oldie “Versace” and the recent hit “Walk It Talk It.” Drake left the stage to let the Atlanta trio perform “Stir Fry” and “Motorsport;” local hero Cardi B, fluorescent pink hair stretching down to her waist, made a cameo to rap her verse; in a cute moment, her husband, the Migos member Offset, kissed her on the cheek. Side A came to a close. No one wants to be stuck on Saturday night, so Drake pivoted one last time. The show’s final shift in tempo and energy might as well have been labelled “Side C.” At this point, Drake served up all his pop hits one after the other, a gust of hooks that have become modern standards, even in today’s fragmented pop landscape. 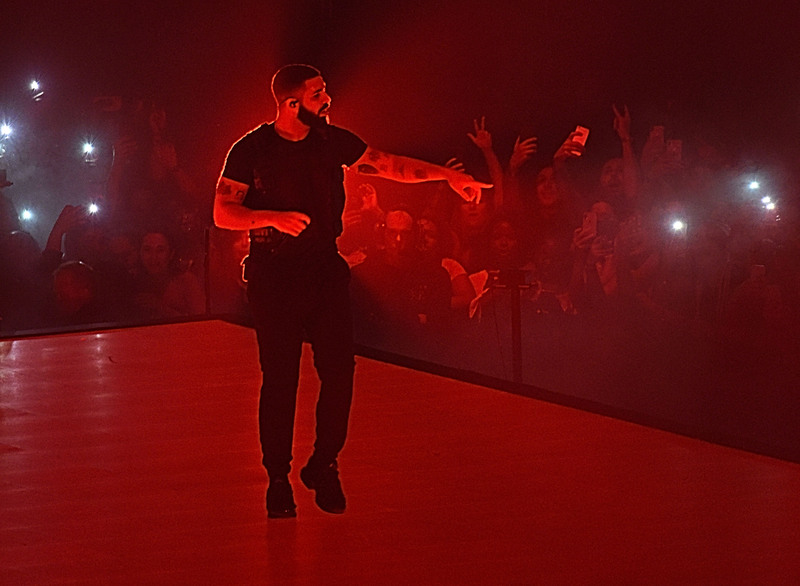 In this final turn, Drake reminded listeners of his musical curiosity. There was a nod to his flirtations with Jamaican dancehall (“Controlla” and Rihanna’s “Work”) and an acknowledgement of his recent interest in Memphis hip-hop (“Look Alive,” a single he gifted to Blocboy JB, and the Scorpion cut “Nonstop,” which might as well be “Look Alive Part 2”). Here too was “Hotline Bling,” a petty marvel that elicited euphoric karaoke. In 2015, “Hotline Bling” hovered at Number Two but failed to top the Hot 100, making it seem like Drake might never get his own Number One. That’s hard to remember in the wake of “One Dance,” “God’s Plan,” “Nice for What” and “In My Feelings,” emphatic multi-week chart-toppers. He performed these all in the show’s final 45 minutes, a swaggering résumé dump and live-show-slam-dunk. The stage set-up was impressively minimal: no musicians and only occasional dancers. Drake made it clear he did not need help to dominate the arena, gloating and chiding and haranguing as he hopped, skipped and sprinted his way around the large rectangular stage. The staging did offer some visual cues, changing imagery to reinforce the theme of whatever song Drake was performing. During “Jumpman,” the stage looked like molten lava; when Migos performed “Motosport,” it became an aquamarine pool and expensive cars drifted slowly through the water. Best of all, when Drake tackled “In My Feelings,” his current Number One hit, the stage became a massive, frenetic Instagram feed, filled with videos of fans attempting the #InMyFeelings challenge. The night ended with “God’s Plan,” a celebration of success, and enough fireworks and confetti for the Fourth of July. Then Drake turned serious. “I want you to look around and understand that tonight, inside this building, we got 18,000 people from all races, from all places, and all we doing is just living our life, listening to music, drinking and smoking and having a good time,” he said.